Imagine you’re out having a beer with some friends when Sir Paul McCartney suddenly starts playing a mere coaster’s throw away. Just recently, McCartney shocked punters at Liverpool’s Philharmonic pub by performing a free surprise concert with a full band, part of a special homecoming edition of James Corden’s Carpool Karaoke. But the ex-Beatle doesn’t need a reason to rock out at random. Over the years, McCartney has displayed a knack for popping up in the most unexpected places, usually with a song at the ready. Whether it’s in a rural country inn, a Bavarian hotel lobby, the middle of Times Square or even on a London rooftop, you never know where Macca will appear. Here are just a few of the most surprising – and endearing – examples of the trend. The Austrian resort town of Obertauern played host to the Beatles when they shot the skiing scenes for their second feature film. While there, they crossed paths with Jacky Spelter, an acquaintance (or so he claimed) from their stint playing nightclubs in Hamburg several years earlier. After a long day of risking life and limb on the Alpine slopes, the band attended a birthday party for Help!’s assistant director held at the Marietta Hotel, where Spelter’s group, Jacky and the Strangers, had a residency. 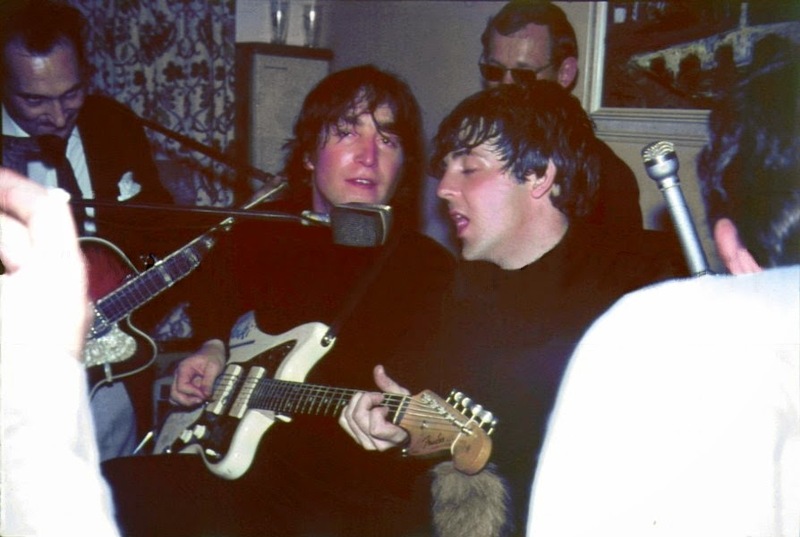 After an untold number of bottles were popped, McCartney and John Lennon climbed onstage for a rowdy and sweaty performance that reportedly drew noise complaints from some guests. It would be the Beatles’ only “show” in Austria. According to legend, the hotel’s owner later requested compensation for some musical equipment damaged during the raucous set. Brian Epstein, the Beatles’ manager, countered by demanding a full concert fee for the Fabs. The owner quickly backed down. In his recently reprinted memoir As Time Goes By, the Beatles’ friend and press officer Derek Taylor recounts a spur-of-the-moment drive he took with McCartney to the small English village of Harrold. It was a trip in more ways the one – Taylor had begun the day with ‘a dollop’ of LSD – but sojourn ended at a local inn, where McCartney and his entourage were treated like visiting dignitaries. Before long, a little girl presented the world-famous musician with an instrument and persuaded him to play. “She had brought a right-handed guitar and landed it in Paul’s (left-handed) hands,” Taylor described in his breathless prose, “but the wizards were producing this play by now and floating with the splendour of this, the strangest Happening since Harrold was born … and the neighbours as they crowded the windows and the parlour, and the children, all caught their breath as Paul McCartney began to play the song he had written that week: ‘Hey, Jude’ it began.” The inn was kept open past closing time, and McCartney continued serenading patrons with tunes, including “The Fool on the Hill,” until the wee hours of the morning. McCartney’s most famous surprise set took occurred alongside his fellow Beatles on the roof of their Apple Records headquarters at 3 Savile Row in central London. The unorthodox performance was conceived as a finale to their documentary film project then known as Get Back (later dubbed Let It Be), winning out over splashier venues like the pyramids at Giza and the QE2 ocean liner. For 42 minutes, the band braved the January chill (Lennon and Harrison wore their significant others’ coats) as they plowed through their first truly live concert in more than two years. Though few could see them, the sound certainly carried, throwing the staid neighborhood into chaos. Police quickly intervened, putting a premature end to what would ultimately be the band’s final public performance. McCartney has taken a lot of flack over the years for his 1984 musical, but it does include remarkable footage of the former Beatle busking outside London’s Leicester Square tube station. Unlike nearly every other incident mentioned on this list, this time around, no one seemed to care. Granted, he had been given a pretty thorough make-under. “They just made me up and dropped me off,” McCartney told the New York Daily News shortly after the film’s release in 1984. “I told ‘em we’d never get away with it, but they kept putting dirt on and rufflin’ up me hair – I was looking better and better – and I figured, why not.” The disguise worked, and not even a rendition of his most famous tune gave him away. “I was standin’ there plunkin’ chords, doing this silly version of the song, and no one noticed it was me. No one wants to look a busker in the eye of course, ‘cus then they’d get his life story. So they’d toss coins and I’d be going, ‘Yesterday, all my troubles – thank you, sir – seemed so far away.’” Any coins that found their way into his upturned hat were donated to the local Seamen’s Mission. McCartney brought new meaning to the phrase “topping the bill” when he strode onto David Letterman’s electric marquee outside the Ed Sullivan Theater to tape a brief concert for his very first Late Show appearance. News of the planned performance spread via social media earlier that day, and soon thousands swarmed the closed-off intersection at 53rd Street and Broadway to watch McCartney and his band play seven songs spanning the catalogs of the Beatles, Wings and the Fireman, his recent collaborative project with producer Martin “Youth” Glover. The occasion had dual significance, marking the 40th anniversary of the Beatles’ rooftop concert (he opened with “Get Back” in tribute), and also his return to the stage where he made his famous American debut on The Ed Sullivan Show in February 1964. McCartney spent John Lennon’s 73rd birthday disrupting classroom lessons with a little rock & roll – a move that surely would have made his late bandmate proud. Macca surprised 400 students at the Frank Sinatra School of the Arts in Astoria, Queens, that afternoon with a 13-song set, opening with “Eight Days a Week.” The songs were broken up by Q&A sessions with the aspiring young artists, moderated by veteran New York DJ Jim Kerr. “This beats going to class,” McCartney cracked at the end of his performance. No argument from the audience. Just a day after dropping in on high school students, McCartney staged a more elaborate affair in the middle of Times Square. He gave fans just an hour’s notice, tweeting, “Wow! Really excited to be playing New York Times Square at 1pm this afternoon!” By the time his yellow cab rolled up to a makeshift stage on West 46th Street and Broadway, the famous crossroads were overrun with thousands of fans. “I’ll be putting a little hat out here later,” he joked with the crowd. “We’re basically busking.” The 15-minute set featured four songs from his upcoming album, New, including the title track, “Save Us,” “Everybody Out There,” and the live debut of “Queenie Eye.” A week later he would perform a similar “pop up” show in London’s Covent Garden. He joined the hired entertainment again at Russian businessman Roman Abramovich’s New Year’s Eve gathering in 2016, where the Killers had been booked to play. McCartney and Brandon Flowers performed a larynx-shredding version of “Helter Skelter” – and proved that Macca’s urge to jump onstage with a party band remains undiminished even after half a century.